During my recent holiday I had the chance to call into Axminster?s Nuneaton store, they claim to have the biggest Festool display in the UK and I can well believe it. It was ing. While there I just had to buy some accessories for my growing collection. I needed to get a replacement 4mm bit for the one that comes with the T15 kit as I snapped the last one when it hit a hidden snapped off screw! This is okay as I have installed a brad point bit in the other one already. Then my eye caught the countersinks. Now when perusing the on-line catalogue they all look the same size and all look to be on the expensive side, leading one to stick to what is in use already. I was pleasantly surprised at the size of the drill/countersink with depth stop. BSTA HS3.5mmCE (492523) The AA size battery is for scale purposes, as these are the same size worldwide, (it does not require a battery to use ). I also got both snail type countersinks to replace my existing countersinks (though I'll hang on to them for the odd occasion I need to adjust hinges), so I can save on changing chucks over all the time, I know with the system on the chucks it?s not that arduous to do, it?s more the tightening and untightening of the chuck to fit each bit that takes time. A test piece with each tool in front of the relevant hole. You can hopefully see how the non-Festool ones tend to chatter, and to be fair and balanced in my remarks , I used to have a snail type by another company that was as good as the QLS ones and that cost as much as them, it was removed from my care some time ago. However, it would not have fitted the centrotec chuck , and that is the point of my purchases. I will be getting the 4.5mm BSTA next paycheck, I?ve promised myself that and will probably add a few more of the drill bits to the order. I am really impressed with the quality of these often overlooked bits of kit. What I?d like to see are a couple of larger sizes of the BSTA range, say a 5.5mm and 6.5mm version with longer drill bits for window and door frame construction. Re: Short review of countersinks. nice review, just looked at the price not much change from 100 gbp? Oh, I spent more than that I also got a new blade for the TS55 and some other non-festool odds and ends I wanted. The problem with the centrotec kit is the amount of stuff included that I will never use. Buyng the drill bits in the packets means you get two spare drill bits, not so when you buy the boxed set or the systainer with the boxed set. I did the math and think it's worth buying them this way, along with any driver bits that I will use. The answer of course would be a Pick & Mix Centrotec systainer so we could get what best suits our work. Another fan of the BSTA HS here. Nice review, it's certainly obvious from the pictures but it's worth mentioning the other brand counter sinks were used and the Festool ones were new. That can account for some of the difference in results. How sharp are the use count sinks? Thank you very much for your review! I was thinking about getting one for quite some time.... Yes, they are very expensive, but when it comes to quality work, it just looks way better when all the countersunk holes look the same. 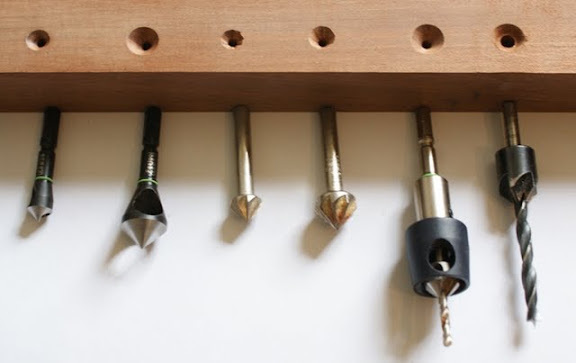 I really want to get the combined drill/countersink but just cant get over the high price. Is it worth it ? i am currently in the process of installing a hardwood deck around a pool area. i am using 75mm stainless steel batten screws. the generic brand countersink only comes in 6mm and is leaving the batten screw loose until it starts screwing into the pine joist. has anyone used the festool countersinks for 75mm batten screws in decking? are the drill bits easily replaced with any non festool drill bits, or will i have to buy festool only? Another vote for the 2 Festool BSTA counter sinks. The small one is ideal for #6 screws and the large one works well for #8 screws, altho the pilot hole does not fit as snugly. Chatter is nil and I have made 100's of counter sink holes without noticing any degradation of sharpness. I like it a lot. Saves a lot of time versus changing bits. I used to use a Snappy combo countersink/tapered pilot bit. But there's no depth stop. I have used the tape-on-the-bit method before, but it's not truly a precision method. I have an aftermarket stop collar that fits it, but then it won't fit back into its case holder. Ergo, attaching and removing the stop collar. The BSTA really is the ultimate: one step, precision depth, fantastic results. I only got it about 3 months ago, and I've used it a lot in cedar, and also in red and white oak, black walnut, and hard maple. Nothing but excellent, chatter free holes. As is usual, I grimaced a bit when I bought it. But, its the first one I reach for when I know the screw will be visible and I want quality results. Based on recommendations from here, I got the 3.5mm to use with #8 screws (most common choice when using screws). The screws fit snugly, but I haven't had any splitting occur. Frankly, if you're burying the screw and are going to cover it with a plug or false tenon (so depth is not a main consideration), or some such, I'd recommend the Snappy or Lee Valley sets. You are correct in your assumption of the 5mm drill. I can't see why another drill bit wouldn't fit, and there are no flat spots like on the replacements for the centrotec hss bits (because you can change the depth. But I really liked how it worked so I ordered the 3.5mm version aswell, which I use regularly and like a lot. I also have the "snail" type countersinks, but I get mixed results with those, I think they are only meant for bare wood. Justin, the 5mm counter sink bit is not a standard bit it a short series tungsten tipped bit ( from what I saw) for drilling stopped holes for fixing Euro hinge carcase plates and soft close fittings that use those short, almost grub screw like, screws that need a 5mm pilot hole. You may be able to use a longer standard drill bit in the main body by creating a flat for the grub screw with a Dremel and an appropriate die grinder bit. A flat is preferable as otherwise the risk of slippage or damage to the fixing screw/allen wrench is very real, and flippin annoying . Rob, Justin was asking about the BSTA HS D5 CE, which is the 5 mm version of the drill/countersink with depth stop from your opening post. Yes, undertood that, but the one I saw in Axminster Nuneaton did not have a drill bit like the 3.5 or 4.5 mm BSTA countersinks, it was similar to a TCT brad point bit. I thought it a bit strange at the time as it had a depth stop but no countersink part, there were the 5mm spring loaded self centering bits further along the display. thanks rob and frank jan.
the countersink i have seen on the australian festool site is 496451.
i assume that it is still available here, otherwise they would not advertise it. hopefully i can pick one up this morning. thanks for the link to the other 5mm countersink for kitchen carcasses. i need that one too!! Yes, they are very expensive, but when it comes to quality work, it just looks way better when all the countersunk holes look the same. I agree. I have the 3.5 and 4.5 mm countersinks now and they are the best I've ever used. You get such a nice, perfectly round hole, it's amazing. I agree also ...... I want a 2.5 mm countersink as well. I use 3 mm and 3.5 mm screws a lot. I just got the hinge centering bit and I found it's exactly the right size for doing window hinges. Only think the drill bit itself was a bit short. It only goes like 2.5 cm / 1 inch deep. Frank-Jan, Thanks I'm not going doo-lally then . Alex, I believe the self centering bit you called the hinge centreing bit is actually designed for cabinet work where the fittings drawer runners, hinges etc. 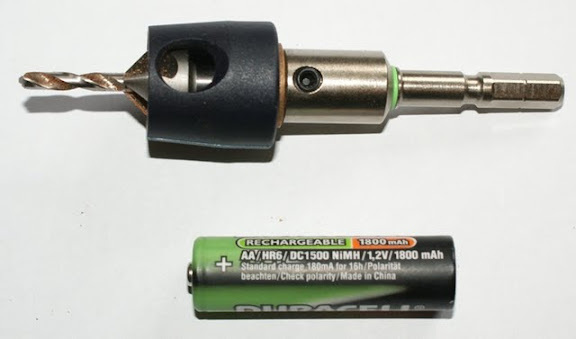 are fixed with those stubby (short) screws, so the drill bit does not need to be all that long. It would be nice if Festool made one for ordinary door hinges, say for 3" and 4" butts, the ones available over here have too much slop in them and when the wood swarth gets packed into them(due to poor design) the bit snaps! But the 5 mm with depth-stop and countersink does excist in the UK BSTA HW D5 (496451). Look at Miles Tool Shop. Strange enough there is also and only a D5 drill with depth-stop but without countersink BTA HW D5 (492522). I make and fit hardwood doors and the ones you refer to as snapping make me "Snappy" when it happens on site as you spend an age digging the broken bit out, redowling the hole, redrilling it with a normal brad bit. The springs go very sloppy very quickly even if only used on softwood frames so come on Festool, those of us who use your kit are giving you a heads up on a piece of kit that would be "snapped up" if you offered it. Good chip clearance, strong spring, strong non deflecting drill bit, adjustable depth and a in a variety of sizes. .......It would be nice if Festool made one for ordinary door hinges, say for 3" and 4" butts, the ones available over here have too much slop in them and when the wood swarth gets packed into them(due to poor design) the bit snaps! I completely agree. I've got a few Vix brand self centering bits that are nice but a Centrotec version would be great. Brice are they better than the ones that "snap"? Guy, the Vix-bit brand is my first choice, but that price on that Ebay set seems high to me. At a trade show a few years back I bought a set of snappy bits. Started with some countersinks then purchased there centerbits (vix style). I've been very pleased. The quality si outstanding. Does anyone know if the Festool countersink has carbide cutters? I have been using the Snappy carbide cutter countersinks and have had very clean cuts in all materials, just no depth stop. They are not carbide, John, but do cut very nicely. No centrotec stuff has any carbide cutters, but it isn't standard HSS either. 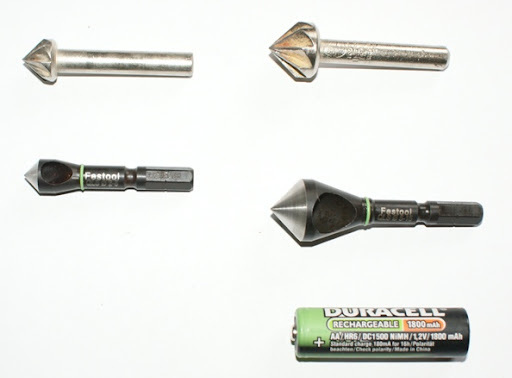 You can tell by the touch and feel and sound of it that it's extremely hard metal, and every centrotec piece, be it a wood or a metal drill bit or a countersink, gives you extremely clean cuts. I've never used or seen any better stuff. Snappy makes some nice stuff but I prefer the Vix-Bit brand. For one thing the sleeve that centers the bit is more round and tapers more than other brands and this gives the bits a better fit in a great range of hinges and other hardware. Any of you on that side of the pond know of a Vix bit retailer who is likely to ship to the UK? Anyone else use these Vix bits and can recommend them? The usual stuff here in the UK are imports from the Far East whereas the Vix bits are US made and so I would imagine the quality control is better.